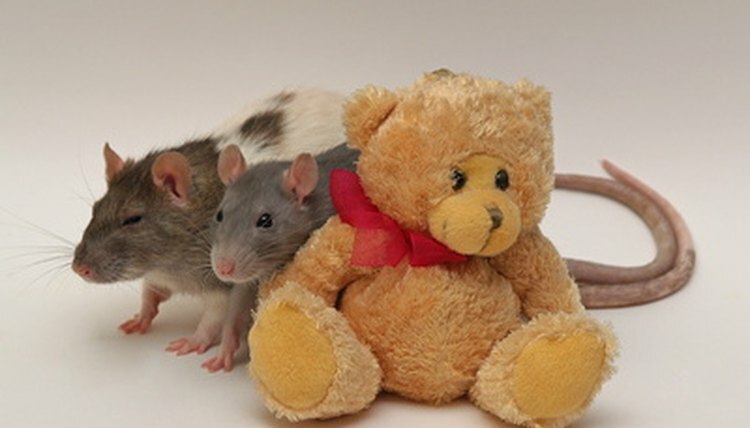 Aside from their size, rats and mice might look quite similar but they don’t make the same sort of pet. Mice are rather like hamsters, happy to do their own thing most of the day, and rats are more hands-on. Deciding which might suit you best depends on your lifestyle and what you are looking for in a pet. Both rats and mice are social and should live in pairs or small groups. For obvious reasons, these must be single gender groups as both species breed at a phenomenal rate. Male mice can, however, be quite aggressive to their own kind, especially in a small cage. A small group of females should be okay. Rats of both genders get on very well with the siblings they grew up with but might not take kindly to a new arrival, especially in the case of males. People sometimes describe rats as being like “little dogs,” and they certainly get on well with humans as well as dogs. Rats can rapidly learn all sorts of tricks, with their reputation for intelligence being well deserved. Male rats are often happy to sit on your knee while you watch television, although females rarely stay still for more than a few minutes while out of their cages. Mice should also be handled but you might not find them quite so responsive or affectionate. If you are after a “pet-pet,” rats might be the better choice. People who like watching their pets rather than playing with them, should derive much entertainment from a small group of mice. If the cage is large enough, mice don’t necessarily need to be let out every day. Rats, however, should get at least an hour out of the cage each day to explore and interact with you. Both species need much the same sort of housing: a large cage with a several levels and at least one little nest box per rodent. A rat cage is obviously suited to rats and it might also be the best choice for mice, provided the bars are set close enough that a mouse cannot squeeze through. If you have a group of male mice, be sure to provide plenty of space to help prevent fights. Basic care for the two species is much the same. Both are omnivores and should have an all-in-one rat or mouse food as the basic diet supplemented with some fresh produce and perhaps a little human food in the case of rats. Remove soiled bedding and leftover fresh food daily and clean the cages out at least once a week. Rats can be toilet trained, which makes daily cleaning easier, and you could try this with mice, although it's not as likely to work. Mice are very small and fragile, which is one of the reasons they are not suitable pets for young children. Rats also need careful handling but they are bigger, and often friendlier, making them good family pets. If you are renting, note that landlords might approve mice or hamsters but have a different reaction to rats, even though pet rats aren't the same as the wild pests. Keeping the two species in the same cage is not at all a good idea. They aren’t natural friends and you run the risk of severe injury or death to both parties. The best friend for a mouse is another mouse and for a rat, another rat.